Career of �NATURAL SPIRIT� can not be mentioned as unclouded. There were ascents and slumps, some members lost interest in future creations and leave but the band rised again. Cradle of �NATURAL SPIRIT� takes the beginning in Chernigiv (Ukraine), town of ancient Slavonic origin and culture. All started in 1997 when Oleg Kirienko and his associates formed "SAURON" band and begun to play black metal. In the same time Oleg meets great guitarist Yaroslav Smolko who joins the band. During short being of �SAURON� guys played dozens of concerts in native Chernigiv. But when recording of first album had to be started "SAURON" broke up due of musical splits between members and two new bands were formed in the beginning of 1999 - "FANGORN" and �SON OF EARTH� (sympho black metal): Oleg Kirienko (guitar, vocal), Yaroslav Smolko (guitar), Vlad Stychenko (bass), Sergey Mischenko (keys), Victor Sen�kov (drums). At the 7th of March 1999 �SON OF EARTH� plays along with �GOD�S TOWER�, �FLYING�, �NOCTURNAL DOMINIUM� in �KSK� club (Chernigiv). �SON OF EARTH� was a young and promising band but Oleg Kirienko always dreamed of other music, in summer 1999 he makes the side-project - �SPELLCRAFT�. �SPELLCRAFT� was formed of Oleg Kirienko (guitar, vocal), Vlad Stechenko (bass), Victor Sen�kov (drums) late Yaroslav Smolko (guitar) and Alexandra Sidorenko (keys), she played in �FANGORN� and was a good like-minded fellow of Oleg both in music and ideology, also joined them. Name of the band was changed to �NATURAL SPIRIT�. Three compositions were made with Alexandra Sidorenko - �Star Throne�, �Legenda�, �Oyra�, late they were included in �Star Thron� album, after them �NATURAL SPIRIT� begin to work in the way of Pagan/Folk Metal filled with themes of paganism and ancient Slavonic Rus history. �NATURAL SPIRIT� continued concert activities. In 1999 �NATURAL SPIRIT� performs in Kiev along with �BLACK INQUISITION�, �FLYING�, etc. In the same 1999 the band meets awesome sound producer Igor Prigorovskiy which became fellow of �NATURAL SPIRIT�. �NATURAL SPIRIT� records the first album demo, �Star Throne� in Igor�s home studio in Chernigiv, it was released by �Moon Records� (Ukraine) and �The Flaming Arts� (Belorussia). 2000 copies of �Star Thron� were distributed. During 1999-2001 the band plays many concerts in countries of former Commonwealth of Independent States, some along with such great bands as �SKYFORGER�, �BEHEMOTH�, etc. In 2001 Vlad Stychenko (bass) leaves �NATURAL SPIRIT� and the band have to play concerts with session bass-guitarists. During this year the band plays in Minsk, Gomel, Brest (Belorussia) and Kiev. In spring 2002 Yaroslav Smolko (guitar) leaves and the band disappeared for 1,5 year but guys continued to create new compositions for �NATURAL SPIRIT� apart. In October 2003 the band raise again with new members: Oleg Kirienko (guitar, vocal), Vasiliy Reberg (guitar), Andrey Moiseenko (bass), Elena Bilyk (keys), Viktor Sen�kov (drums). Then �NATURAL SPIRIT� plays some concerts in native Chernigiv, Kiev, Rechitsa (Belarus). In spring 2004 Sergey Kirichenko (guitar), old fellow of �NATURAL SPIRIT�, takes the place of Valiliy Reberg. Sergey played with the band as session guitarist before. In September �Ruskolun� album was released in limited edition for band�s expense. In winter 2005 contract with russian "More Hate Prods" label was made and in summer 2005 "Ruskolun" was remastered and released with additions ("Vladimir" video and �Abort� new song demo). In the same time (spring-summer 2005) Elena Bilyk (keys), Andrey Moiseenko (bass) and Sergey Kirichenko (guitar) leave �NATURAL SPIRIT�. 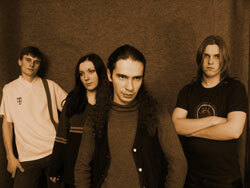 In June 2005 Yaroslav Smolko (guitar) comes back to the band also come Sergey Vlasov (keys) and Julia Shevchuk (vocal). �NATURAL SPIRIT� performs at "Metal Heads Mission 2005" (Evpatoria), "Shake Your Head Fest" (Kiev). In 2006 Oleg Kirienko changes his domicile and moves to Kiev. Unfortunately it was the cause of band's breakdown. In Kiev Oleg did not leave his attempts to rise �NATURAL SPIRIT�, he has lots of stuff, potential, interesting ideas but there were real problem with searching of musicians, until in autumn 2006 Oleg meets Vadim Muschenko (bass). Vadim was a DJ in that time and played bass also he worked as sound producer in Kiev Post Production (Sound Force) studio. Oleg and Vadim start to record the third album in November 2006 in KPP studio. There were no financing so guys could not fully rent the studio and had to record after work and at nights when it was cheaper. The recording delayed due of permanent tiredness, sometimes after two or three days of round the clock working was hard to appreciate tracks sufficiently. Were made over 20 new compositions but only 7 were included into album, other 4 ones were made by Oleg before meeting with Vadim. During recording time several variants of every track were made till the final sound was found. Ivan Popov (keys) joined "NATURAL SPIRIT" and added his spirit into recording. In the beginning vocal tracks were recorded by old band's fellow Julia Shevchuk but she could give very little time for it and the band had to look for new vocalist. Lots of feminine vocals were listened but guys accidentally met Katerina Prischepa. In this way "NATURAL SPIRIT� got new vocalist. The album got the real sound thanks to her great unique voice and interpretation. Guys meet Ilya Ivaschenko - talented sound producer and really awesome man, in the moment when �NATURAL SPIRIT� collected all the stuff for "Sita Rosa" album , he started final mastering. As result all the tracks had to be recorded once again. Some compositions were changed and elaborated during new rerecording. They got absolutely new sound. �NATURAL SPIRIT� works not only in studio in the time of "Sita Rosa" recording, great musicians joined us - Danila Komornikov (guitar) and Andrey Goncharenko (drums) and we performed several concerts. So in 2007 the band played on different feasts and concerts in Kiev, Ilychevsk, Dneprodzerzhinsk, Chernigiv but still the main goal was album that is why number of concerts were reduced. In the beginning of 2008 Andrey Goncharenko (drums) leaves �NATURAL SPIRIT� to advance his own project so Alexander Ganzha, young but perspective drummer, join the band. Third album is just finally mastered but �NATURAL SPIRIT� already makes stuff for the forth one. In May 2008 �NATURAL SPIRIT� finished recording of "Sita Rosa" the third album, it was the upshot of band's rebirth with new members. Ilya Ivaschenko, sound producer worked at recording and mastering of the album in Kiev Post Production (Sound Force) studio. The recording lasted 1,5 year. Twenty compositions were made during recording of "Sita Rosa�, some of them were completely changed and elaborated till we did not found the final sound. All members of �NATURAL SPIRIT� applied to this album their hearts and talents. For it's history �Natural Spirit� performed along with BEHEMOTH , GODS TOWER, SKYFORGER, BUTTERFLY TEMPLE, MASTER, ARKONA, NOKTURNAL MORTUM, NAPALM DEATH, ROSSOMAHAAR, etc.